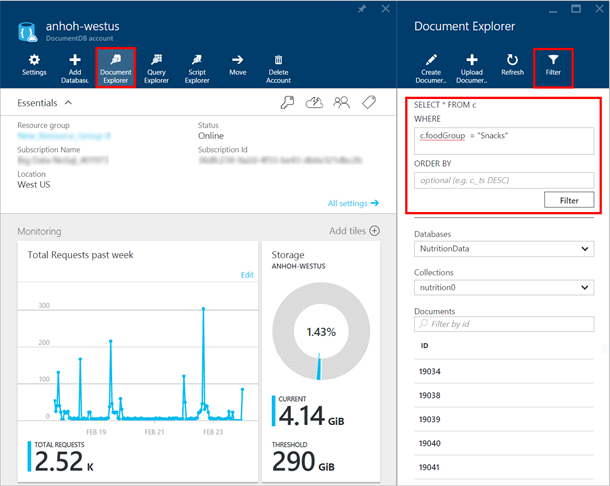 The DocumentDB team is excited to announce updates to the Document Explorer and the Script Explorer within the Azure portal. Document Explorer now supports filtering on your JSON documents and Script Explorer now supports executing stored procedures. In case you are unfamiliar with Azure DocumentDB, DocumentDB is a NoSQL JSON document database designed for rapid and iterative application development. We are continuously striving to improve the developer and data management experience for all DocumentDB users and these new capabilities are steps towards providing you with a robust portal experience. DocumentDB natively supports and automatically indexes JSON data. Found in the Azure portal, Document Explorer allows users to freely view, edit, create, and upload JSON data to DocumentDB. Now with filtering support, you can view, edit, and delete specific documents returned by your filtering query. You can access the Document Explorer from the database account, database, or collection blades. Set filter settings by clicking the Filter command located at the top right of the Document Explorer blade. The filtering query adheres to DocumentDB’s standard SQL syntax. You can read more about DocumentDB’s querying language in the SQL query and SQL syntax in DocumentDB article or the SQL query cheat sheet. Filtering queries accept both a WHERE clause and an ORDER BY clause; both of which are optional parameters. Note that enabling a filter by clicking the Filter button will automatically refresh your documents using the specified filter. For more instructions on how to use the Document Explorer, visit the View, edit, create, and upload JSON documents using DocumentDB Document Explorer article. You can access the Script Explorer from the database account, database, or collection blades. In the Script Explorer blade, you can either create a new stored procedure through the Create Stored Procedure command located at top of the blade or open an existing stored procedure. You can now execute stored procedures by clicking the Save & Execute command. You specify the arguments for your stored procedure in the inputs pane located underneath the script editor. And, after the stored procedure execution, the results will be loaded in the results pane. Stored Procedures are powerful tools that allow you to directly execute application logic on the server side. 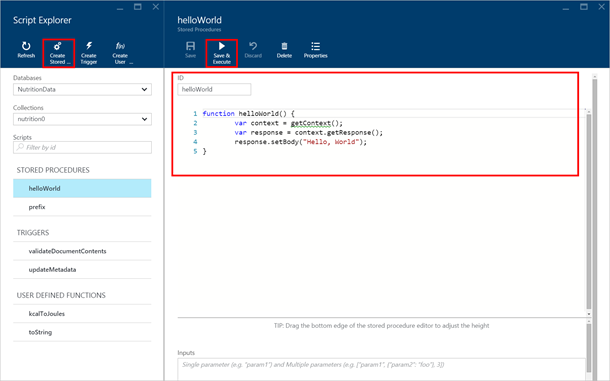 For more instructions on how to use the Script Explorer, visit the Create and run stored procedures, triggers, and user-defined functions using the DocumentDB Script Explorer article. And for more sample stored procedures, check out our GitHub repo.